Speaking and reading from the age of eight months and a university professor at 19, mathematician Alia Sabur made news in the US again this year when the 21-year-old offered BP her idea for stopping the Gulf of Mexico oil leak. Where other former child prodigies have struggled to live up to their early promise, she appears to be bridging the gap between the heights of a gifted childhood and the more level plains of adulthood. Speaking to BBC World Service, the New York mathematician has attributed much of this stability to a loving family background and a parallel career in classical music. Her story offers lessons in how gifted children - often pitied for not fitting in when they are not being envied for standing out - may cope successfully with being different. A sense of humour appears to be part of it for the diminutive scholar, who likes to quote from the media-world satire Anchorman: The Legend Of Ron Burgundy. "I'm kind of a big deal!" she says, echoing Ron with a laugh. When, on her second birthday, little Alia received a set of Charlotte's Web, the classic American children's novel about a smart spider, she was "frustrated that the audiobook was too slow to listen to while reading". "In a lot of ways it was a pretty typical childhood and in a lot of ways it completely was not," she says. The adult Alia stresses how many opportunities she was given to develop: "My parents gave me the freedom to explore what I was interested in as long as I wanted to, whether it was reading or drawing or playing with friends." Her parents have always been her biggest influences, she says. One piece of advice they gave was to learn self-defence at school, where this small, quiet, bright girl attracted bullies. Taking up taekwondo, she ended up a black belt. "Everyone tells you to ignore bullies but that doesn't normally work on them too well," she says. "A few times not backing down and nobody bothered me after that, which was a pretty good life lesson, but some things are simpler when you're a little kid." It took the young Alia, and her friends, a long time to realise there was anything different about her: "Little kids are often very oblivious to things going on around them." The big change came at the age of 10 when she entered Stony Brook University, New York. "People tended to assume that I was somebody's kid that they were bringing to the classes with them," she remembers. Though most were good to her, "there were always some who were randomly offended by the fact there was a kid in their school". 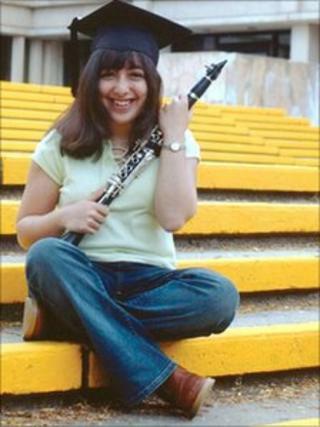 While she was progressing through maths, the young Alia was learning music, first the recorder, then the clarinet, and eventually playing in university ensembles and the New York Youth Symphony, where she was principal clarinet. "Music has been a really important part of my life for about as long as I can remember," she says. "Even besides just my feelings on music, the fact that I have been part of groups of musicians and participating in orchestras and performances for so long has definitely shaped the kind of people I am with and the time I spend. "I cannot imagine how things would have turned out if I had not been involved in it at all because so many things that I did for so long were influenced by that." BP did not take up Ms Sabur's plan to block its broken riser pipe with expanding tyres, but she believes that aspects of the "soft seal" eventually applied were similar to her idea. If she has no "inventions" to offer the world just now, she takes great pride in her published scientific research and, with her first professorship already behind her, science remains her passion. "However much we know, it's a tiny fraction of what there actually is to know about," she says. "I try to learn as much as I can about as much as I can." Asked about the maxim attributed to Einstein that "intellectuals solve problems; geniuses prevent them", she says she does not feel her intelligence has placed a burden on her. "I want to make the world a better place and I will use all my abilities to do that, including my intelligence, but I don't feel it gives me a responsibility to do anything in particular," she says. The 21-year-old, who watches Dr Who and reads Terry Pratchett, believes she feels much the same way as anyone of her age, "trying to figure out where they stand and what they want to do". A high IQ, she argues, is not an obstacle to living a normal life. "The same way that an athlete doesn't display their talents while spending time with friends but isn't considered to be 'suspending' their abilities, I don't 'suspend' my intelligence," she says. "It's part of who I am, and I don't feel the need to prove that I'm smart, or hide it either." Alia Sabur was interviewed as part of BBC World Service's series, My Philosophy.